Ahhh... It's the simple pleasures of life I enjoy the most. Tapas and Tequila are among my most favorite at Epcot and all of Walt Disney World for that matter. What better place to experience both than La Cava del Tequila inside the Mexico Pavilion at Epcot's World Showcase. Tequila is a spirit made from the blue agave plant, primarily in the area surrounding the city of Tequila, 40 miles northwest of Guadalajara, and in the highlands (Los Altos) of the western Mexican state of Jalisco. The red volcanic soil in the surrounding region is particularly well suited to the growing of the blue agave, and more than 300 million of the plants are harvested there each year. Agave tequila grows differently depending on the region. Blue agaves grown in the highlands region are larger in size and sweeter in aroma and taste. Agaves harvested in the lowlands, on the other hand, have a more herbaceous fragrance and flavor. Mexico has claimed the exclusive international right to the word "tequila", threatening legal actions against manufacturers in other countries. Tequila is most often made at a 38–40% alcohol content (76–80 proof), but can be produced between 35–55% alcohol content (70–110 proof). Though most tequilas are 80 proof, many distillers will distill to 100 proof and then dilute it with water to reduce its harshness. Some of the more well respected brands distill the alcohol to 80 proof without using additional water as a dilutant. Tequila was first produced in the 16th century near the location of the city of Tequila, which was not officially established until 1656. The Aztec people had previously made a fermented beverage from the agave plant, which they called octli (later, and more popularly called pulque), long before the Spanish arrived in 1521. When the Spanish conquistadors ran out of their own brandy, they began to distill agave to produce North America's first indigenous distilled spirit. The tequila that is popular today was first mass-produced in the early 19th century in Guadalajara, Mexico. Consider this flight as Tequila 101. If you are new to tequila tasting give this sampler a "shot." This top-shelf overview will open up a whole new world of tastes for you. As you're served your cast member can walk you through the flavors. Feel free to ask questions and take notes and discuss with your friends! To be classified as Reposado, a Tequila must be aged for a minimum of 2 months but less than a year. Tequila Reposado is a perfect balance of wood, fruity notes, vanilla, and spices that transport you to a magical place of timeless beauty. Añejo is a delicate blend of uniquely aged Tequilas. Añejos are aged in small, white oak barrels for a minimum of 12 months. This Tequila has several aromas, like chocolate, almonds, and wood; it is soft and sweet. As in many premium red wines, blends must be adjusted to each vintage; a lot of care and attention is paid when blending Añejo, making it smooth, distinctive, and extraordinary. This tasty treat is the perfect combination of sweet and savory! 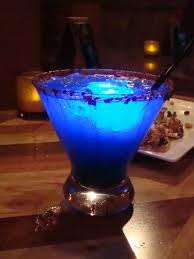 Sure, it looks like something you would drink in some galactic cantina from Star Wars, but the Magic Blue is totally out of this world! Taste the Familia Camarena premium rested Tequila, blue Curacao, fresh lime juice and agave nectar, served on the rocks with a hibiscus Himalayan salt rim and a souvenir LED blue ice cube. Keep the LED cube so you can recreate this drink at home! What's a trip to Mexico with out their famed Margaritas? Choose 5 of the following 6 options to sample in shot glasses. Your server will deliver the sampler and give you an overview of the various flavors. All of these flavors are available in full-sized versions as well. All of them super yummy and very top-shelf! Flights are great ways to experience the various flavors before committing to a certain brand. If you're serious about your tasting session you may want to try taking notes of the various flavors. What NOT to do... http://youtu.be/mQqw1ZZbn-c - Amateurs. Ilegal Mezcal happens to be one of my favorites due to the smooth taste, smoky richness and sweetness of roasted agave. These shots should be sipped on to savor the flavor. Ilegal Mezcal (pronounced eeh-lay-gal) is a traditional Mexican liquor made from the agave plant by mezcaleros in Tlacolula, Oaxaca (Mexico). The somewhat sinister, yet unique name, arose from John Rexer's numerous expeditions south across the border, "creatively" bringing his favorite mezcals to patrons of his bohemian tequila/mezcal bar, Cafe No Se, in Antigua, Guatemala. Unlike most Tequilas which are, today for the most part, distilled industrially, Ilegal Mezcal is a 'small village' effort--a product entirely handcrafted from the heart of the Espadin agave plant found in various towns across Mexico. The age-old process begins by baking the agave in an earthen pit which is stone ground to a pulp; leaving it to naturally ferment, and then, distilling twice in small batches. Be a man and shoot the scorpion! This is not for the weak at heart. Shoot the scorpion or the worm with the Oro De Oaxaca Reposado. Tweet your video @ScorpionMezcal and become an internet sensation like myself and fellow Sorcerer Radio DJ Jeff Davis! Mezcal is made from the agave plant. The agave is also used to make tequila but in a different process. While tequila is made exclusively in the state of Jalisco, mezcal is exclusive to Oaxaca. Although tequila is most popularly consumed in the margarita, mezcal is almost exclusively served as a shooter,with or without a lick of salt and bite of lime. Technically speaking it could be said that Tequila is a form of Mezcal, but it can not be said that Mezcal is a form of Tequila. See the infamous "Shooting the Scorpion" stunt featuring Sorcerer Radio's Aljon Go & Jeff Davis. http://ustre.am/:E9xY. Aljon drinks the Oro de Oaxaca with the worm while Jeff drinks the Scorpion Mezcal with the actual scorpion! As a tip be sure to have some some tortilla chips moving from one drink to the next. You can even have a taste of their home made sangrita (not to be confused with Spanish wine-and-fruit-based alcoholic beverage sangria). It's blend of orange, lime, tomato and/or pomegranate juices, or pomegranate-based grenadine with the addition of something spicy (hot sauce or fresh/dried chile), and sometimes white onion and salt. Having a fresh palate will ensure your enjoyment of the subtle flavors of the tequilas. I hope you've enjoyed this month's Top 5 list! 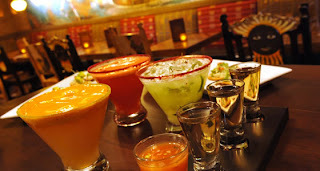 As usual please leave some comments about your favorite Disney drinks from La Cava del Tequila below. 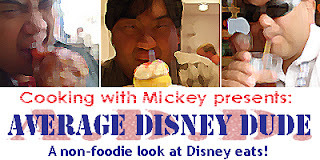 I look forward to meeting you in person at the Sorcerer Radio 10th Anniversary Event, Cooking with Mickey's Foodie World Tour and Disney's D23 Sip and Stroll events! I hope to see you all there! Until next time, keep it real! Thanks for reading! Aljon Go is a musician and blogger that loves Disney and food! He is also a co-host of the "WDW Tiki Room" variety show and "WDW After Dark" adult Disney vidcast on Sorcerer Radio, where he is also the station manager. Follow him on Twitter @WDWTikiRoom and @JediMouseketeer!